There are 10 inches of snow laying on the ground outside my front door, but I want barbecue chicken. What's a girl to do? Make this recipe! If the flavors of the sweet and smoky sauce don't appeal to you, use one cup of your favorite MSPI-friendly barbecue sauce. If your barbecue sauce is too thick for easy use, just thin it out with a splash of water. 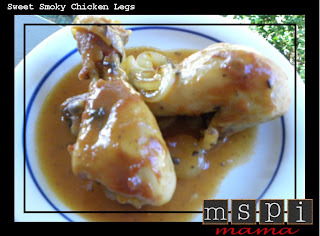 This is such an easy recipe and economical, too, because chicken legs are a very inexpensive cut. Serve the chicken with mashed potatoes. Comfort food at its best! Place onions in greased 13-in. x 9-in. baking dish; arrange chicken in a single layer over onions. Combine the remaining ingredients and pour over all, completely coating chicken. Bake, uncovered, at 350° for 1 hour or until a meat thermometer reads 170°, basting several times. Tip: Can't find MSPI-friendly liquid smoke? Try substituting a teaspoon of MSPI-friendly Worcestershire sauce. The sauce won't have the smoky flavor, but it'll still taste mighty good. Where did you find your mspi friendly liquid smoke... Coming to omaha tomorrow! I honestly don't remember, Sheila. It's been collecting dust on my shelf for quite some time. I'm away from home right now, or else I would tell you at least what brand it is. If you can't find the liquid smoke, then try the Worcestershire sauce. It works great, too! I found some at Whole Foods and should have bought it but got scared with the caramel coloring. Since discussing it on the listserve this afternoon I wish I had grabbed it! I also thought worcestershire had soy in it and that's why it was a no no - but I've googled it and I think I'm completely wrong. Is worcestershire safe too? I have a1 in the fridge. What do you think of using that? Some brands of Worcestershire are MSPI-friendly and others contain soy protein. Lea & Perrins is MSPI-friendly. It'll definitely work in this recipe.